Before I share all of the wonderful frugal living tips that we came up with for cloves, I wanted to take a moment to thank everyone for being so engaged in this series. As you know, this series began as a way to re-create my grandmother’s lost WWII Homemaking journal. The original quest was to gather as much information as we could remember and share this piece of my grandmother with our entire family. Throughout the past several weeks the series has morphed into more than what I had originally intended. Week after week, more and more family members have joined in on the quest, offering their input on the topic of the week. It has become kind of a family reunion, all of us coming together to celebrate our family’s legacy. Without the help of my family this series probably would have fizzled out weeks ago. There were so many times when I just couldn’t think of a topic and thank goodness one of my family members would come to the rescue. This series has also opened my eyes and made me look at things in a totally different way. Now, when I’m at the store and I need to purchase a product for a specific task, I ask myself two questions “Can this product be used for more than one task?” and “Is there a more frugal alternative?”. It’s amazing how much money you can save by asking yourself these two little questions. Now let’s look at the multiple uses that you can get from a little jar of cloves. oil and apply to the area. clove oil to the burn. tea will help loosen mucus. – to stop bleeding and reduce pain, immediately sprinkle with ground cloves. – to reduce pain from tooth removal, apply the affected area with clove oil. ball and place it in the ear. to relieve, drink a tea made by steeping 5 cloves in 8 ounces of boiling water. Allow it to steep for 10 minutes. Drink 2-3 time per day. to avoid, chew on a clove. – to help reduce, chew on cloves. – to prevent, drink a glass of water with a drop of clove oil before eating. increase, add a drop of clove oil in your beverage. to soothe aches and pains, rub the muscle with clove oil. Nausea – to relieve, drink a glass of clove tea. water. Let it steep for up to 20 minutes. Don’t drink on an empty stomach. and itching, rub the affected area with clove oil. clove oil in your beverage. of clove oil on the gums. oil on a rag and place on your forehead or temples. and apply to the area. and let it cool. Use as a final rinse after shampooing. Breath – to freshen, chew on a clove. Puffy Skin – to reduce puffiness, apply clove oil. Skin – to moisturize dry skin, apply clove oil to your skin. oil and water. Be sure to shake the bottle well before spraying. clove oil and 2 cups of water. Scrub the area and don’t rinse. piece of cotton and tie it shut. adding water as the water evaporates. and water. Shake well and spray the ants and their trails. Bugs – to repel, in a spray bottle, mix clove oil and water. Be sure to shake the bottle well before spraying your skin. water. Spray the weeds with the mixture and repeat weekly or after rain. Mix the cloves and oil in a bowl, cover and let it sit for 24 hours. Strain and store in an airtight container.Are you as amazed as I am with how many uses there are for cloves? 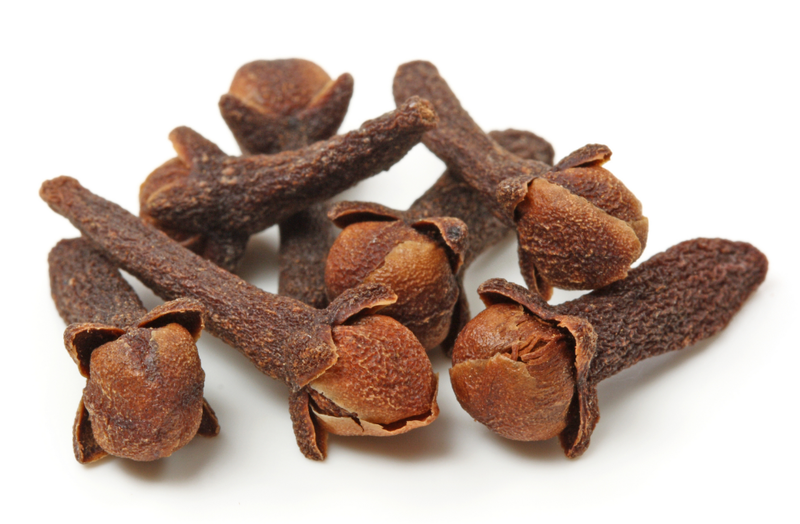 Do you have any unusual household tips using cloves that you can add to this list? That is so cool. I never knew there was so many different uses for cloves. Robin, my favorite memory of cloves is how my mom would put them in an old coffee with water and simmer them on low during Christmas. She had to watch that the water didn't burn dry, but oh what a heavenly smell. I have done it from time to time also. Thanks for sharing with SYC. I was in a car accident and received brain damage in the frontal lobe of my brain and the back lobe of my brain. I lost all my memory from the day of the accident to the day I was born, My neurologist told me about a type of tea that would help mend my brain and replenish the cells. At the at point I was willing to try anything to regain the strength of my brain and boy it has really help and I love the taste. Wow what an endorsement! Happy to see that it helped. That is clever, I’m going to try it around our fruit trees!